The two churches that I’m serving are having fabulous (if I do say so myself!) worship services on Sunday. After celebrating the crossing of the Red Sea last week, this week we are going to sing together in response to God’s grace, just as Miriam, Moses, and the Israelites did. Our Sing to the Lord! service will feature the top ten hymns voted on by each congregation. I didn’t vote. I figured that since I get to vote every week, then it wasn’t right for me to participate. Most of them, however, are songs that I like but would not put into my top ten. For example, there’s nothing wrong with “Amazing Grace,” but it’s a bit overdone… what makes it a favorite over so many other good choices? 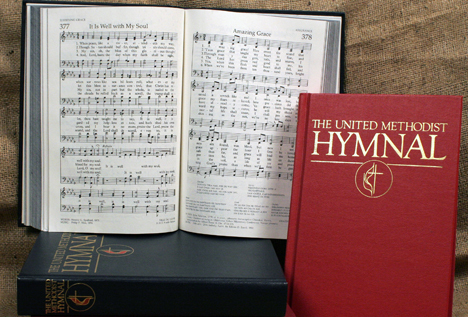 The rules are that they had to be in the United Methodist Hymnal (1989) – so no “The Summons” or “She Comes Sailing on the Wind” or other fabulous hymns from The Faith We Sing hymnal. My second rule for myself was that it has to be a song that consistently makes my heart thrill to hear/sing it. Doesn’t this video make your heart thrill? And my third rule (this as I begin narrowing down my list from 20 to 10) was that I had to be able to sing at least one verse by heart. For this time in my life, they no longer give me that same thrill that they once did. I still love them, but—especially with “Here I Am, Lord”—I am no longer moved to tears by them OR inspired to dance by them (Don’t worry, “Lord of the Dance,” I still think that you should be sung allegrissimo!). Out of the 20 hymns selected by the two congregations (14 distinct hymns, since six of the hymns overlapped), precisely zero were by Charles Wesley. There is a good chance, however, that I am currently drawn towards hymns that my congregations don’t know because I know it will be a lot of work to get us to sing them. Okay, enough commentary! That’s my list. How does your list compare?? POSTSCRIPT: Rambing Anna played! Let me know if you blogged your top ten hymns, and I’ll link to you, too! This entry was posted in Uncategorized, United Methodist Church and tagged hymns, music. Bookmark the permalink. Thanks for the fun exercise! Have a great Sunday! I’ll admit that I wasn’t familiar with Brian Wren’s “Christ is Risen” until you pointed it out this morning. I will have to add that to the Easter repertoire 🙂 It’s amazing what a different feel that same tune has when sung with “Infant Holy, Infant Lowly” (which I always thought of more as a lullaby) and with the “Christ is Risen” lyrics. “Come, Thou Long-Expected Jesus” very nearly made it into my top ten… it got bumped by “Lo, He Comes” because I love how the latter bridges the end & beginning of the liturgical calendar… I would love (if my congregations knew it!) to end Christ the King Sunday with “Lo, He Comes with Clouds Descending” and then the following week begin the service with it… reminding ourselves of the eschatological hope of Advent. I’m not ready to list my top 10 yet (still ruminating), but I was pleased to see Isaac Watts made your list! “Love Divine, All Loves Excelling” is one of my favorites, and will likely make my Top 10, but my #1 with a star is “My Shepherd Will Supply My Need,” also by the great “Doctor Watts.” Clearly we all owe a great debt to 18th Century British Congregationalism.